Want Us To Search For You? Our goal as a full service Yacht Broker is to provide you with the best possible consultation and service. Our promise is we will handle each and every relationship with honesty and integrity and represent your interest and needs as if they were our own. We realize to achieve any level of long term success, we must satisfy customers that will return and also refer others to us as well. Whether your needs are either to purchase or sell, we invite you to allow us to demonstrate what we have learned during a lifetime of boating and assisting customers just like yourself. Thank You for visiting our site and considering St. Clair Yacht Sales as your Broker. The Regal 3860 Commodore Express Cruiser offers quality speed, comfort and versatility in an attractive, stylish package; her two stateroom, two head layout is ideal for the cruising family or two couples. While her large bridge deck and cockpit will accommodate a crowd for picnic outings. 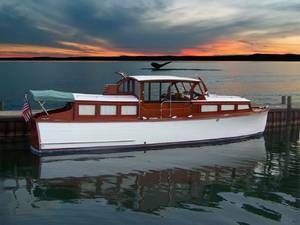 "Floatin Doc" is nicely equipped with optional larger engines, quality electronics, bow thruster and many desireable options. She is particularly attractive with her black topsides, she has been used only in fresh water with 860 hours and shows like a new boat.